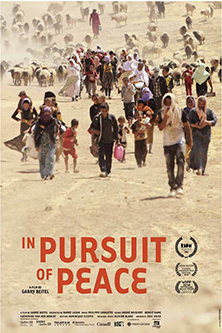 In Pursuit of Peace makes the case for unarmed civilian peacemaking and mediation as a response to violent international conflict. We follow four Canadian peacemakers as they take us inside the drama of their work in some of the world’s hottest conflict zones: land disputes in the Democratic Republic of the Congo, the civil war in South Sudan, IDP camps with displaced minorities in Kurdistan in Northern Iraq. Image, Philippe Lavalette; editing, Dominique Sicotte; original music, Olivier Alary.